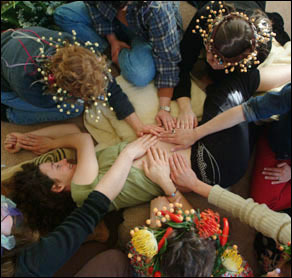 A Blessing Way was traditionally a Navajo Ritual created to spiritually support and empower the new mother for her journey of birthing and motherhood. In recent times, this beautiful Ritual has been adapted as an alternative to Baby Showers, where the focus tends to be more on the gifts and the baby, rather than on the Mother and her experience. There is a lot of information on the web and wonderful books that you can buy that can give you great ideas about how to create one for the new mamma in your life, whether friend, sister, daughter, relative. I will list some ideas below but really, just have fun and make them your own. “We create a ritual space that looks and feels special. Guests need to become centered and ready to participate in a sacred ceremony. We form a circle to create a container of support for the mother-to-be. “We state the Blessingway’s purpose so we all know what we’re doing and why we’re doing it, and while we’re at it, we share our intention with the powers that be. Introducing ourselves helps us connect with one another. We help the mother-to-be let go of any negative beliefs or fears she may be carrying so that she can embrace all the blessings, prayers, and honor we wish to bestow upon her. “We honor, pamper, and adorn the mother-to-be to fill her with positive and empowering energies. We tell her stories to encourage her, offer blessings to support her, and give her gifts that will help guide her on her journey. “We raise energy to affirm and charge the work we’ve done and to send our good intentions out into the world. We weave a web to maintain our connection with one another beyond the day of the ritual. ~Every guest is asked to bring a flower that reminds them of the Mother. These flowers are used to make a simple crown for the for the mamma which is then placed on her head at the beginning of the circle, while everyone is talking and getting acquainted. At a certain point everyone can say which flower they brought and why. ~Guests are also asked to bring an offering from nature like a small crystal, a feather, or a rock. These are offered to the Mamma and placed in a box or on a special altar plate that she can keep to remind her of everyone’s well wishes for her during the birth. ~Another sweet idea is to ask each woman to bring two beads, one for mamma and one for baby. During the ritual these beads are used to bead a necklace for the Mother and a bracelet for baby. ~Another wonderful idea is a candle that is lit and then passed around the circle. Each woman offers a word they wish for the mother like “strength” or “endurance,” and when the candle reaches the Mother, she blows it out and it can be re-lit by her when she begins her labor! Also a nice take away gift to give every woman in attendance is a small candle to take home with them that they can light for the Mother when they receive news that she has gone into labor. ~Lastly, it wonderful to close the circle by having some yarn or thread which each woman wraps around her wrist and the passes to the woman next to her who does the same. Once it has gone around to each woman in the circle including the mother, some words can be spoken about the web of connectivity and support within her circle of woman friends. Then each woman takes a turn to cut the strings of the woman next to her and help tie the yarn or string onto the wrist. Everyone ends up with a string bracelets that stays on until the mother goes into labor. A chain system can be set up where the Mother or father to be lets one person know when it happens and she is in charge of texting or calling the rest of the women to let them know. At that point everyone can cut them off and the blessings can be immediately releases to the birthing mother. As you can see and imagine, it is an incredibly moving experience and it really does help prepapre the Mother spirituality and mentally for what is to come. Our culture is so devoid of meaningful RITUAL so we need to have the Vision to create sacred space for ourselves to honor and support eachother through these most meaningful Rites of Passage. As women, we need eachother, more than we know…. Even just reading this made me feel like I was part of something sacred. I am creating a blessingway for a dear friend and this was beautiful. One of my favorite parts at a mother blessing I just attended was toward the beginning. We went around the circle and each woman said something they love and admire about the mother-to-be. It was so heartfelt and loving, and reminded her of all her innate strength and wisdom that will serve her in labor and motherhood. I LOVE this site!! !The photos are really great,especially the pregnancy photos.My very favorite photo is at the top.The pregnant belly art is just beautiful!! 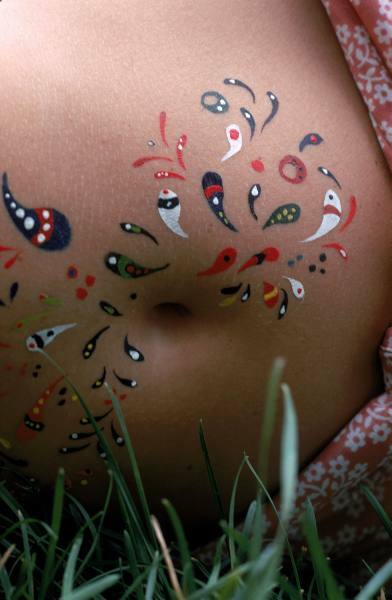 !However,there’s one other thing about that particular pregnant belly that really grabs your attention.That one thing is the deep innie bellybutton of the mom-to-be!!!!! I had this ceremony today, I had no idea how it was gonna be or turn out but I was truly amazed and still amazed at how wonderful this experience is for a pregnant woman! I felt 10th of pounds lighter than before the ceremony and would do it over and over again. Am now positive and ready to welcome my baby to the world with the help of all the amazing women that celebrated me today. Thank you so much for this lovely site. We are at beginning of planning a Blessing Way Tea Party for my daughter. It is such a consciousness shift from the old showers, Wonderful. I really appreciate the inspiration! I would like to hear what you did for the blessingway tea party! That sounds like so much fun! I’m pregnant with my first child and reading this awakened a longing for deeper meaning in my life and a desire to instill a deeper meaning into my child’s life. I love this idea. This feels soooo good. Sian, I am looking forward to be a part of this. Anilda, I pray that you find peace through your God-given breath and trust that your version of God supports you and your friends. I pray that you deeply support each other towards each blessed birthing. May the mother to be feel empowered in mothering, and be showered with love during her ceremony. A blessingway is a sacred event open to all. I can imagine Pope Francis giving me an Amen on this. Blessings sister, I can see the pope agreeing too. you make it your own! There are many ways to make it approved by the church. It is essentially a giant blessing. Pray to the saints. Pray to Mary. Pray the rosary! Reflect on the saints. So many ways!!!! <3 While the ceremony has Native American roots, a Mother Blessing can be anything you want it to be. So inspiring ;-) Thank you for your words and all that you put out into the world. Jai Ma! A child is a miracle of life, a spark of Divine light and love from God, Source whatever faith you hold onto, to be bestowed blessings from loved ones near and far is truly a gift of love and appreciation for all life. The more love the Mother and baby receive before, during and after pregnancy is a web of love to be held sacred. Blessings to all Mothers to be, I am the Mother of two teenage children who I am blessed to have in my life. I hold dear in my heart two children in Spirit, who are as much a part of my life as my children on Earth. This is absolutely beautiful! I will definitely do this one day.. So many blessings 💜 thank you so much for this website and all the inspiration and just so much good coming from it. loving that white onesie with the navy dots—where is that cute thing from? How wonderful and supportive. Who’s pregnant 🤰? I am definitely going to gave a blessing circle. I felt the power of women so deeply while reading this. I am about to gift a Blessing Circle to my step daughter as she prepares to give birth to her third child, a daughter after two beautiful boys. She has not altogether been excited about having a third child so this will hopefully help her to feel the sacredness and the unity of our support. I have loved preparing this and I’m really looking forward to sharing it with all the women present on January 2, the last full moon before her due date. Now, I have a question … I love so much about this website and I’ve searched for the name of its creator to acknowledge her but I can’t seem to find it anywhere. Please help? Thank you and abundant blessings be yours. Hello Dianne! I’m sorry to be getting back to you a bit late as today is the 2nd, but I hope you are having or have had a beautiful Blessing gathering for your step daughter! Thank you for your acknowledgement :) My name is Mijanou Montealegre. Many Blessing your way!